Your impressions and bases will be poured as one unit in a bubble free mix of our own Super White orthodontic plaster. This is a hard plaster that produces accurate and durable study models. The models will then be trimmed to exact bite relationships. All but the rough-cut models will be carefully hand sculpted blending the anatomical tissue to the model’s base and also removing any unwanted blemishes caused by voids or air pockets in the impression. Great care is taken not to damage any soft tissue detail. Ortho Cast also offers an “Economy Model Service”. This service is an excellent choice for orthodontists requiring good, accurate, but lower priced study models that are also nicely discounted based on the quantity sent per month. Economy Models are poured and trimmed to the same standards as our Premium Models. The basic difference is that they are only lightly sculpted; tissue is not blended to the base like the Premium models. Economy Models are also returned faster than Premium models; in lab time: 3-4 days! Impressions are poured with bases, trimmed and sculpted, bases sanded smooth and polished. Labeled with patients name, age, date, etc. We offer Inked Labels, Typed Labels, Soaped and Unsoaped models. Premium Service “B” : Semi-FinishedImpressions are poured with bases, trimmed and sculpted only. Not polished. Labeled with patients name, age, date, etc. Premium Service “C” : Rough-Cut Impressions are poured with bases, trimmed only. Not polished. Not sculpted. Labeled with patients name, age, date, etc. 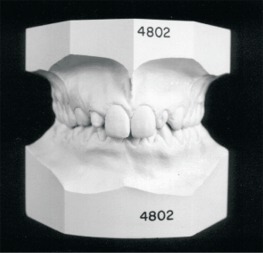 Ortho Cast has been specializing in professional quality Study Models since 1969. We can help when times get hectic: Even if you are not a regular customer, we’ll be glad to help when you’re in a pinch. Whether its for a few days or a few months, don’t hesitate to call us. Ortho Cast provides all shipping supplies. You can download forms from our website or call us and we will fax them. These prices are for models we pour from your wet impressions; shipping not included. Economy Service “A” : Completely Finished Impressions are poured with bases, trimmed and lightly sculpted, bases sanded smooth and polished. Labeled with patients name, age, date, etc. Economy Service “B” Semi-Finished Impressions are poured with bases, trimmed and lightly sculpted only. Not polished Labeled with patients name, age, date, etc. Economy Service “C” : Rough-Cut Impressions are poured with bases and trimmed only. Not sculpted. Not polished. Labeled with patients name, age, date, etc. .
Our Economy Models are discounted by your monthly volume. Premium Models usually require about 1 week in our lab, Economy Models about 3-4 days. Ortho Cast also offers ABO board quality models, new models duplicated from your existing casts, and our NEW digital study models called ortho-graphic.